Adding Aulterra powder to food or supplements can significantly increase their effectiveness. Aulterra is the result of years spent in researching the perfect combination of ingredients. Now, in its finely-tuned formulation, Aulterra is a homeopathically activated combination of natural paramagnetic and diamagnetic substances, which produce a significant enhancement when combined with nutraceuticals and pharmaceuticals. Aulterra's unique properties may also reduce negative side effects. "Therefore, as the evidence shows, a combination of a pharmaceutical product and Aulterra will show a significant enhancement of the pharmaceutical." Dr. Hamilton concluded that Aulterra powder increased product effectiveness by as much as 60%. With research results continuing to accumulate, demand for Aulterra is certain to escalate. Just as you wouldn't think of making your favorite dinner without the benefit of spices, health care companies will soon include Aulterra in all of their quality formulations. Increased energy and healing power of substances exposed to Aulterra are dramatically displayed by Kirlian photography. 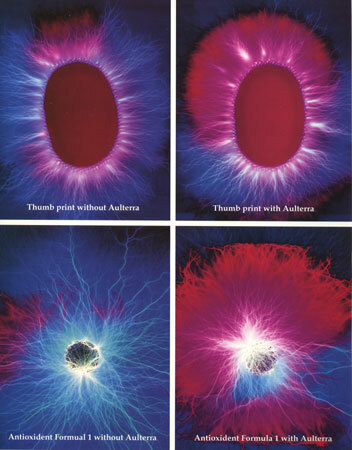 These photographs, taken by Chris Wodtke, (kirlian.com) show significant increases in the life force hues, indicating greater healing force. This turbo-charged healing can be part of your product when you add Aulterra powder to your formulation.